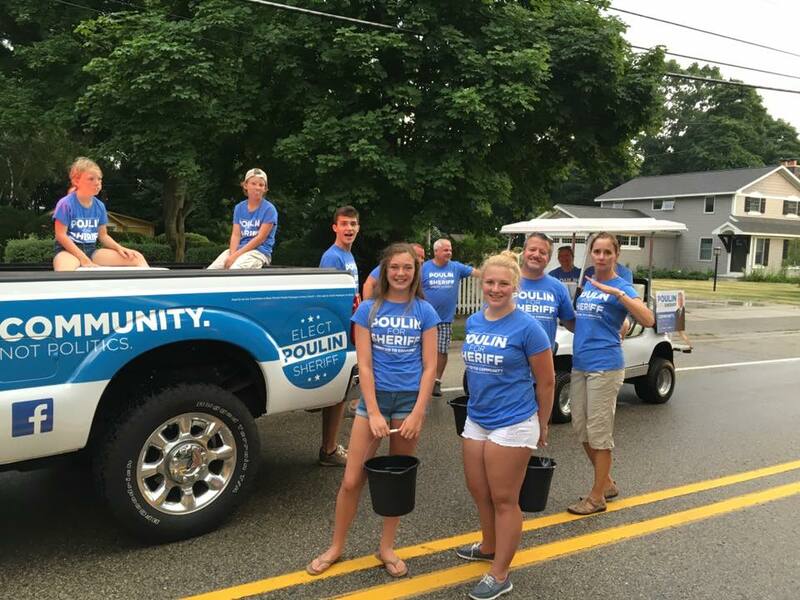 "I've had the privilege of knowing Michael Poulin for his entire professional career. During that time, I've watched him become an intelligent, ethical leader in our County's law enforcement community. 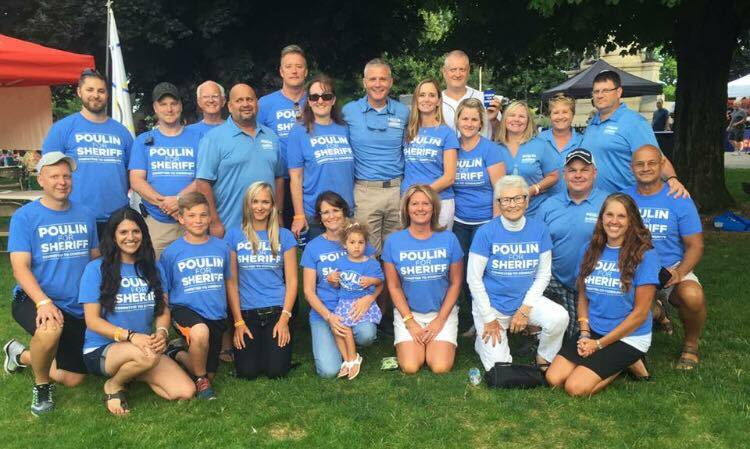 I believe Michael Poulin will be an outstanding Sheriff who will help ensure the safety and security of greater Muskegon in the future." "Overnight the yard signs have appeared and and it is pretty obvious that the August Primary is just a few short weeks away. 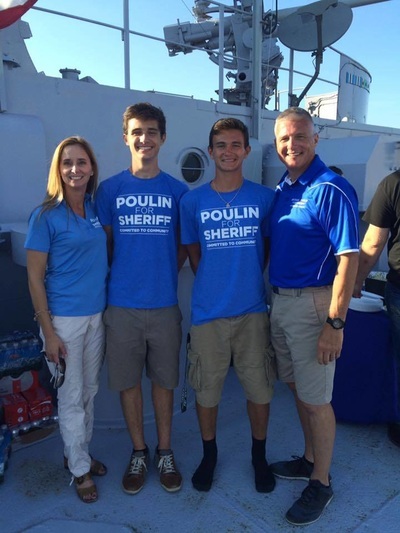 With this in mind, I am very excited to announce that I am personally endorsing the candidacy of Michael Poulin for Sheriff of Muskegon County. I have known Mike for many years and I have come to appreciate his ethics, leadership and unwavering commitment to our entire community. Mike is the kind of leader who represents a better future for all of Muskegon County. 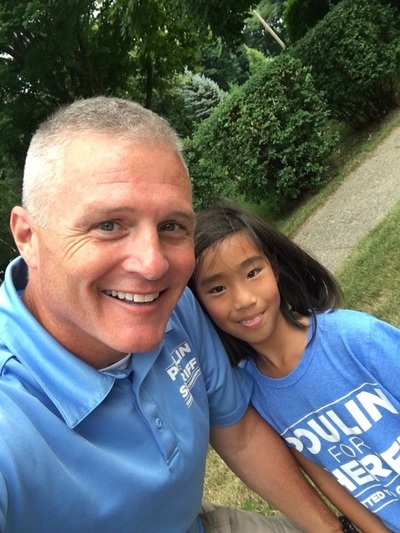 Mike will not only work hard every day to keep our community safe but will continue to help us develop and sustain critical prevention efforts that support our youth. 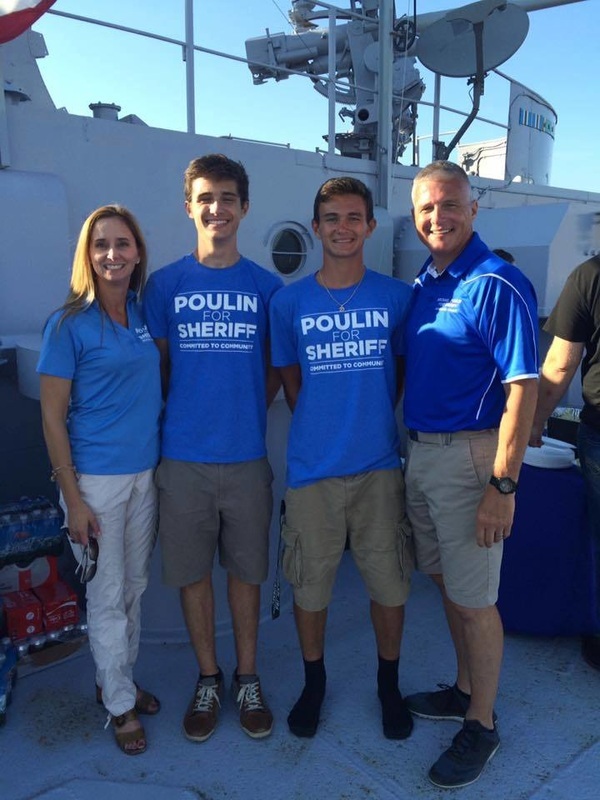 “For the record I am endorsing Michael Poulin for the office of Sheriff of Muskegon County. I am a lifelong resident of Muskegon Heights, and I love this community. It's no secret that now more than ever it needs love and support. 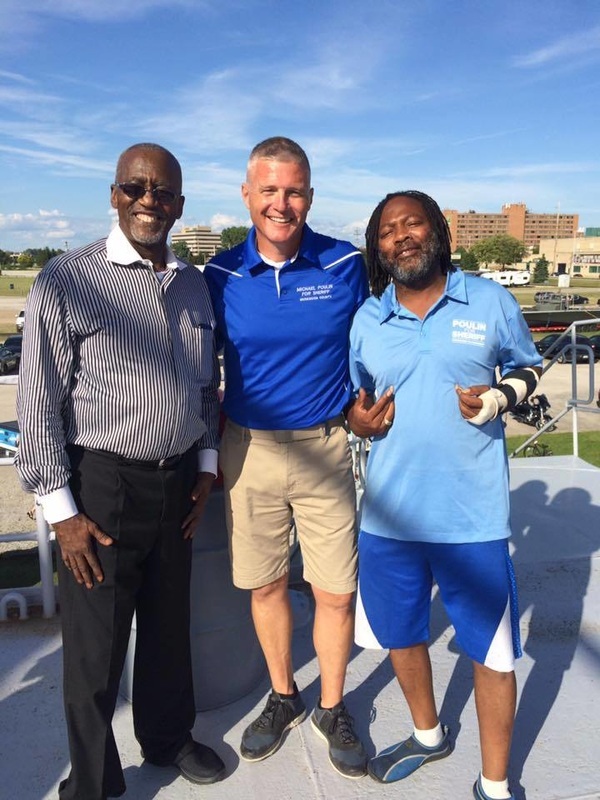 We need to come together to heal the community of Muskegon Heights. That will not happen without the care, commitment and passion of the entire community. I see that passion in Michael – I see his passion for Muskegon County and his belief that true change comes when you collaborate with others for the best outcome. I believe that under Michael's leadership we will work to unite leaders and change makers to improve the safety and quality of life in Muskegon Heights and the larger community. I trust that when he tells me he will do something, he'll do it. ​“I remember when I first met Michael Poulin. He was a young officer starting his career in Law Enforcement. Michael was very eager to learn and his demeanor was already that of a seasoned officer. When Michael started with the Sheriff’s Office, I had the pleasure to ride with him. I knew then, he would be a great asset to the Sheriff’s Office in the years to come. My first impressions of Michael came true during his years with The Muskegon County Sheriff’s Office. Michael was a great patrol officer and moved up the ranks at a steady pace learning quickly in every job he held. When Michael took command of the traffic unit, the Sheriff’s Office received awards every year because of his knowledge and his commitment to make Muskegon County one the state’s leaders in traffic safety. ​“Leadership is more than a title or a job. It is a quality effective people possess and utilize to develop people, communities and programs; it is action, not words. As a community member who values quality leadership, one of the qualities that matters most is the ability to lead with the heart of a true servant. Anyone can obtain a title, but the work that is required to make the title have meaning is what truly matters. “I have appreciated the work that Mike Poulin puts in for the advancement of our community. He possesses all of the necessary qualities that will ensure our Sheriff department in Muskegon County will restore faith in our law enforcement system. 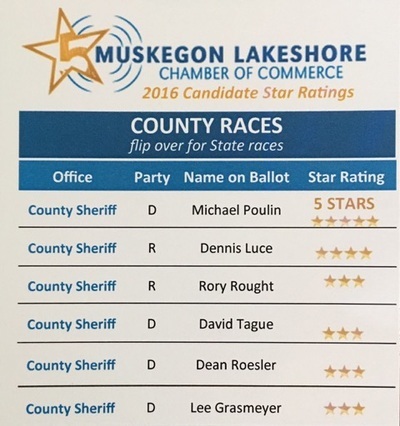 Mike has extensive experience in collaborating with other agencies throughout our State to enhance the quality of service the citizens of Muskegon County deserve. He has been a leader in organizing the program to safely dispose of medication to prevent prescription drugs from entering our water systems and endangering our citizens. Anyone can hold the office, but not just anyone can do the job. The work required calls for a candidate with Solid Experience, Expertise, a proven record of Effective Leadership, Integrity and Service. Mike will work to restore high standards, trust, sense of value for our community, transparency and accountability. 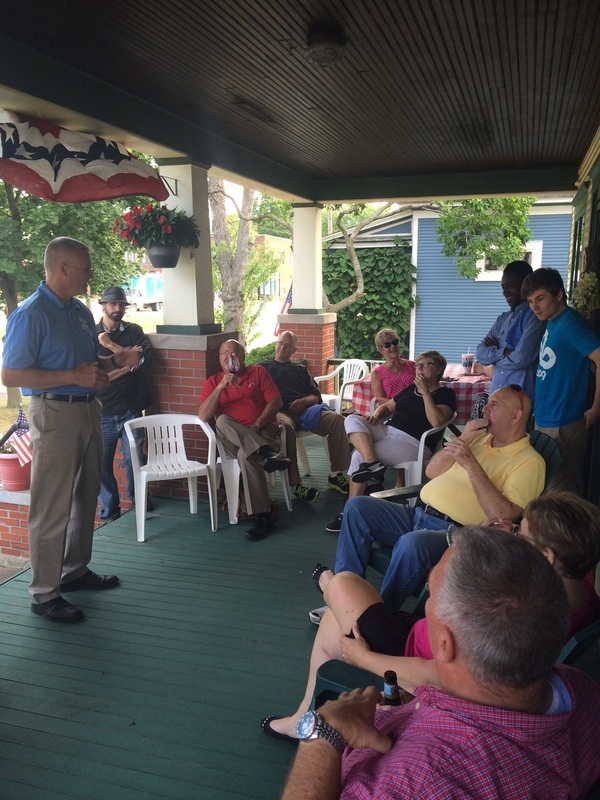 "I had a lunch meeting with Michael Poulin, a candidate for Muskegon County Sheriff... He will do a great job if elected, so don't forget to VOTE: August 2nd..."
Richard Ciezak, Past President; Utility Workers Union of America; Consumers Energy, BC Cobb Plant. 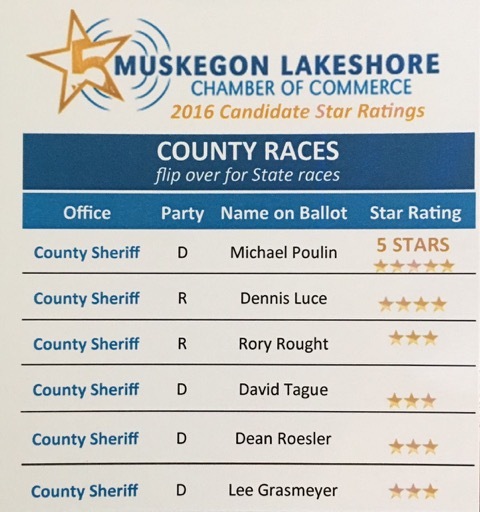 “As a member of the Muskegon County Fire Service for 29 years I have avoided publicly endorsing local candidates. This year I cannot idly stand by and hope for the best outcome. Due to many factors and ultimately out of concern for the overall safety of our communities I know that Michael Poulin is the right person to provide professional, honest and sincere leadership as the Muskegon County Sheriff.